The prospect of death, Dr. Johnson said, wonderfully concentrates the mind. The main thesis of this book is that it does much more than that: the idea of death, the fear of it, haunts the human animal like nothing else; it is a mainspring of human activity—activity designed largely to avoid the fatality of death, to overcome it by denying in some way that it is the final destiny for man. I completed a recent reading of this old classic yesterday (13 December, 2015) because I was interested in Becker’s contribution to Terror Management Theory, which I find so helpful in understanding the ways U.S. leaders are publicly responding to terrorist activities. 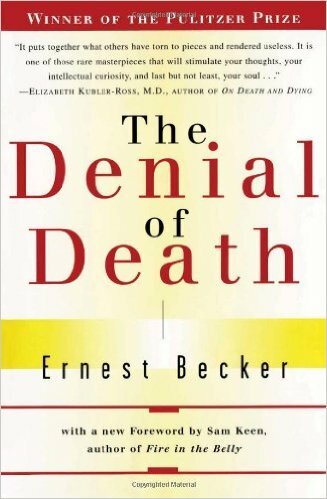 Becker’s ideas are more than forty years old and many have not withstood the test of time. However, his basic premise that we deny the reality of death in many ways remains valid. And his examples of the ways we carry out heroic quests to deal with our mortality continue to provide a way to analyze the ostentatious projects of billionaire industrialists, outlandish policy statements of politicians, and inflammatory action calls of religious leaders as well as the microprojects of ordinary folks. Culture provides many organized ways for people to gain recognition and thereby bask in at least a slither of potential eternal glow following an otherwise ignominious death. The hope is, at least that one’s family and close friends may keep us alive in their memories. To contemporary readers, and especially to psychological scientists, the heavy dependence on psychoanalytic theory for explanatory concepts will seem archaic if not off-putting. As a psychologist, it was an informative reminder of the influence Freud and his often rebellious protégées had on societal leaders and academics for decades. At times it appears Freud is a foil for Becker’s ideas but I think this is primarily because one could not reasonably discuss the ideas of others without the Freudian context. 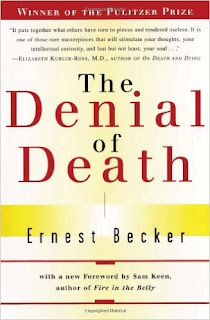 Setting aside the psychoanalytic jargon, Becker adequately makes his point that death as a force for life can be seen in the work of philosophers such as Kierkegaard as well as the early psychoanalysts. What continues to be helpful here and elsewhere is his capacity to view the competing approaches of anxiety offered by psychology and religion—primarily Christianity. So we can find culturally approved ways to live on in creative works that hang in museums or stand in public places or we can be honored with plaques for our service and generosity. But Christianity offers another path. We may be poor and unknown in this world but God sees our good works and will reward us in the hereafter—and most noteworthy, the Christian has eternal life free of the pain common to that felt in our mortal bodies. I’ll confess that as Becker plumbed the depths of psychoanalysis, I found it difficult to keep my focus on his big ideas rather than what I perceive to be the limitations of psychoanalysis. Nevertheless, I perked up at his discussions of neuroses, psychoses, and other varieties of mental illness because it revealed a worldview that has changed remarkably in the past four decades. Although the psychoanalytic worldview continues, it does not drive the bulk of scientific inquiry nor does it characterize the primary methodologies of psychotherapists. But Becker’s analysis reveals how people used to view people with a mental illness. Those interested in the contemporary issues of LGBT rights will find his discussion of homosexuality particularly enlightening regarding the views held by the medical and psychological establishment for the majority of the 20th Century. As you might guess from the section title, "mental illness is a failure of heroism," people have lost their ability to succeed within their culture. They have not found a path to victory over life’s battles. Part III consists of one chapter, Psychology and Religion: What is the Heroic Individual? I see Becker offering a competing choice between a psychological view and a religious view. The psychological approach uncovers reality and focuses the patient on coping with the vicissitudes of this life. However, the psychological view is much like a religion where people are gods. It has the elements of a special language and even rituals but the hope is in the adequacy of the patient presumably learned from the psychotherapist. In contrast, the religious view offers what people really need—a belief in a higher power. I’ll include two quotes to show how Becker sums up his ideas. Today, Becker’s book is a must read for those who wish to trace the origins of the important role of anxiety and terror that stimulated those brilliant graduate students (Jeff Greenberg, Tom Pyszczynski, and Sheldon Solomon) who formulated Terror Management Theory (TMT) in 1986 and went on to direct or stimulate hundreds of empirical studies. TMT research reveals the reliable finding that death awareness leads to predictable results. People generally respond to mortality cues by finding ways in their culture that offer a meaningful life now and connect a meaningful life to some form of symbolic immortality. I write as a Christian with a long history as a psychotherapist and psychologist of religion. I find Becker offers a number of insights into the various anxiety management efforts of entire cultures, religious rituals, and the everyday efforts of people who would live on in their social media pages, memoirs, selfies, arts and crafts, and countless other ways. Becker also offers a warning of sorts to psychotherapists. He’s not the first of course to notice the similarities between priests and psychotherapists. But he does emphasize the similarities of religion and psychotherapy and suggests the limitations of each. Religion offers an other-worldly solution to the problem of existential anxiety but psychotherapy helps people cope with the anxieties of daily life. In my view, effectively treating religious clients ought to be a collaborative effort between clergy and clinician. And clinicians ought to broach religious ideas carefully as they may not conform to scientific realism but they may well serve an important function of buffering clients against their struggles. That is, aside from the theological truths, removing a key element of a person’s faith may leave them without a vital component of their support system. Reference (The version I read). Becker, E. (1997). The denial of death. New York: Free Press. The concept of heroic response to death awareness reminds me of U.S. Grant writing his memoirs when he had cancer which lead to his death. With respect to the quote from Becker, "It is an immortality formula," makes me think that or effort to convert is linked to our belief in truth, that truth matters, that it is a route or connection to a reality which can't be touched/damaged by us or others. It is supposed to be immutable, therefore, self defending, and self evident once people are faced with it. But this has turned out not to be true in so many cases. Thanks for the correction and insightful comment. Prev comment by Doug Olena.